Own your piece of the disappearing pie in the up-and-coming, fast-growing Mott Haven neighborhood, booming with new developments! Live close to Manhattan and take advantage of this income-producing, semi-detached 2-family home in move-in condition. Walk into the light-flooded Living Room of the spacious 4 BR / 2 Bath duplex apt., large enough to accommodate a full dining area that leads out to a nice-size backyard for outdoor entertainment. This unit has an extra room for use as a den, a play room, a 4th bedroom, or anything you want! Floors are being sanded and re-polished, walls are being freshly painted, some doors/windows will be replaced and kitchen will come with updates and new stainless appliances. Ist flr. apt. 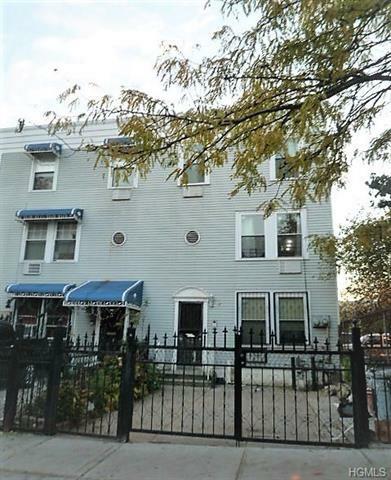 has 2 spacious BR&apos;s and 1 bath and is carefully maintained by current tenants. May be delivered vacant or w/ paying tenants. Washer/Dryer hook ups available for both apts. Walk to the 2, 4, 5 and 6 trains, shops, park, public services...this is a PRIME location!